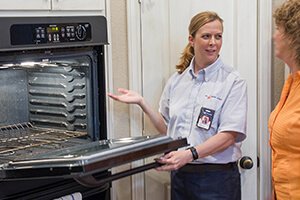 Established in 1996, Mr. Appliance does more than repair home appliances; we also strive to deliver superior service by taking the extra steps needed to fully protect your home. Like all Neighborly brands, we are locally owned and operated. Nick was very nice and accommodating to my schedule. Very friendly, knowledgeable and made sure all my questions were answered. I would definitely use their services again and highly recommend. Just a friendly company. Willing to go the extra mile to help you out. Great friendly, well organized company. Very courteous and well aware of my inconvenience in not having my appliance. I highly recommend this company. The technician was knowledgeable, friendly and worked quickly. This account hasn't been verified. Do you need us to send you another confirmation email? Don't have an account yet? Join Us Forgot password? Password must be 8 characters, with 1 number, and 1 special character (!@#$&*). Please enter your confirm password. Would you like to receive the latest updates, offers and helpful tips? This account already exists. Did you forget your password? This account hasn't been verified. Do you need us to send you another confirmation email? We sent you an email to reset your password. Sign In? Note: If you are not receiving the email please check your junk/spam folder, password reset emails can be flagged incorrectly. Sending a confirmation email to your account. We're almost done! An email has been sent to you to confirm your account. All you need to do is click the link provided in the email and we'll take it from there. Note: If you are not receiving the email please check your junk/spam folder, account confirmation emails can be flagged incorrectly.